Chocolate has been my best friend since I was about three. It makes me happy when the chips are down, it makes others smile, and generally is the best thing in life. Last weekend I stumbled across what might be considered on par with Christopher Columbus' discoveries: The Little Chocolate Teapot Company. 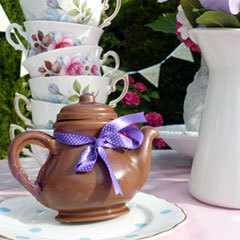 It's what it says on the tin - The Little Chocolate Teapot Company create small chocolate teapots, chocolate lollipops and chocolate slabs, which come in various flavours. Estelle Lovejoy (the brains behind this company) is a clever lady. 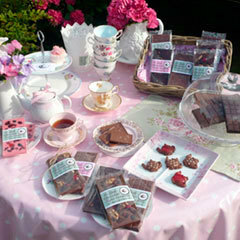 For beautiful handmade chocolate and events Estelle designs specialist chocolate treats in the most darling of creations. 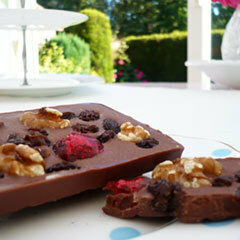 It sounds like a craft, and it is – making chocolate that looks and tastes this good is an art, and one that is very yummy. I have tried the white, dark, and chocolate 'buttons' that are like the well-known Dairy Milk chocolate buttons but deeper in flavour - the dark chocolate buttons in particular have a richness that second to none. Apparently this is because of the Guatemalan cocoa beans and the way Estelle processes the chocolate.